In the early 1990s, soon after the fall of communism in the USSR, British theologian Martin Palmer went to Moscow to help Russian Orthodox priests develop environment programmes. One evening he had a conversation which changed his view of the world. An old priest showed him that the city of Moscow was laid out according to the images in the Book of Revelation, and when he expressed his amazement, they told him that every medieval city in Europe incorporated circles, triangles and crossroads symbolising the Unity of God, the Trinity and the crucifixion. In Russia before the Revolution they had never forgotten that they were building the City of God when they created towns and cities. But in Britain, that memory had largely been lost. 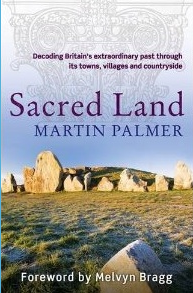 Sacred Land holds the keys to unlock the meanings hidden in Britain’s cities, towns and fields, and shows how anyone, with a few useful tools and pieces of knowledge, can decode the landscape and understand more, too, about how we live. Place names indicate a town’s origin: towns ending in thorpe, holme or by were originally Viking settlements; places ending in bury or field were originally Saxon and you can trace the limits to the Viking invasions in the north by looking at the place names on maps today. There were four major ecological collapses in Britain which can be traced through the human signs they have left on the land. Sacred Land aims to help us reconnect with our environment and encourages us to re-examine the surroundings we take for granted. It is a guide to the almost undiscovered Britain around us.